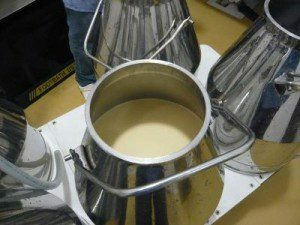 Cheesemaking at P.A. Bowen Farmstead is regulated by the Maryland Department of Health and Mental Hygiene (MDHMH), specifically a pilot program for raw cheeses implemented in 2009, and made permanent in 2013. 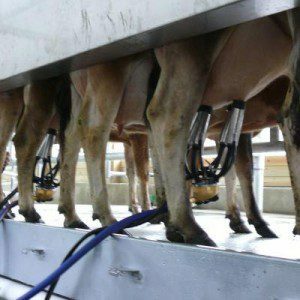 The milk and cheese on the farm are tested regularly for indicators of cleanliness and pathogens. The cheese production takes place under conditions of strict sanitation in a new, state-of-the-art facility. We produce cheese from early spring to late December. Then, throughout the winter, everyone gets a rest – cows and people. Our signature natural-rinded blue cheese celebrates Maryland’s seasons with handcrafted flavor. Here in Prince George’s County, we grow and maintain lush pastures with many species of grass, giving our milk a wonderfully complex taste that fluctuates with the seasons. This blue is equally rich in character but does not bite back; it is calm and creamy. The nutty aromas come to the forefront of this refreshing blue as we dampen those salty, peppery punches. We use Penicilium roqueforti mold culture, rennet, and Celtic sea salt. We age each batch for over 60 days. 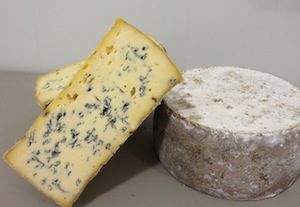 Our Prince George’s Blue won Third Place at the 2014 American Cheese Society competition held in Sacramento, CA, and Gold and Silver Medals at the Los Angeles International Dairy Competition. A wheel of Prince George’s Blue cut in half to display the beautiful veins of mold. Classic aged cheddar with a creamy texture and buttermilk tang. It is balanced with savory notes of toasted pecans and fresh churned butter. We use a traditional hand mill and patience to craft this rustic clothbound cheese. Extra care is taken to age wheels in a monitored custom environment for a minimum of six months. 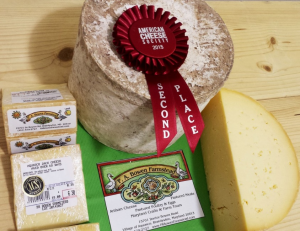 Our cheddar won Second Place at the 2013 American Cheese Society competition held in Madison, WI, and Gold and Silver Medals at the Los Angeles International Dairy Competition. Introduced in 2012, this cheese was named by one of our customers. DC Cheese is made just like blue cheese, but without the blue mold. Try it as a queso fresco in your favorite Mexican dish, toss it with cooked vegetables, sprinkle it over the top of a casserole, or enjoy it on any cheese or fruit plate. Dreamy Creamy has won Silver and Bronze Medals at the Los Angeles International Dairy Competition. We also produce a delightful aged Jack cheese, which is a washed curd cheese, sweeter and more nutty tasting than the cheddar . Some customers say it’s their favorite of all our cheeses. Aquasco Jack has won Second Place at the 2015 American Cheese Society competition in Providence, RI, and Gold and Silver Medals at the Los Angeles International Dairy Competition. We can eat them without care. Brie and chevre and camembert. A and D and K and more. And when we hang out with pals, it’s yum. It’s a food that always pleases, Cheddar, jack and Parmesan. Copyright 2013 Sally Fallon Morell With thanks to Marianne Gregory for the first line! RAW CHEESE IS A NATURAL PROBIOTIC: Raw cheese is a rich source of beneficial “probiotic” bacteria, containing as much as yoghurt, and with many more species. BLUE CHEESE CONTAINS UNIQUE ANTI-INFLAMMATORY FACTORS: European scientists suggest that ingredients in molded fermented cheese could improve heart health. CHEESE FROM GRASS-FED COWS CAN PROTECT THE HEART: Vitamin K2 and a compound called CLA both offer strong protection. Cheese from grass-fed animals is one of our best sources of both substances. RAW CHEESE FROM GRASS-FED COWS IS A COMPLETE FOOD: Raw cheese from grass-fed cows contains fat-soluble vitamins (A, D, K2, E), minerals (calcium, phosphorus and many trace minerals), B vitamins including B6 and B12, and even vitamin C! CONVENTIONAL CHEESE IS MADE WITH GENETICALLY MODIFIED ORGANISMS: That’s right! Commercial cheese is made with “vegetarian” rennet, produced by genetically modified bacteria. People who are sensitive to MSG and other additives may find they are also sensitive to cheese made with vegetarian rennet. 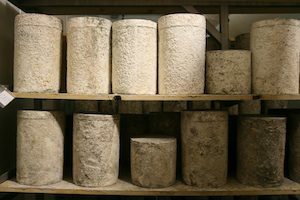 Traditional cheese is made with old-fashioned animal rennet. THE FDA ALLOWS COLORING AGENTS (yellow 5 and yellow 6) IN CONVENTIONAL CHEESE: These colorings have been linked to hyperactive behavior. The first step in cheesemaking is to milk the cows! 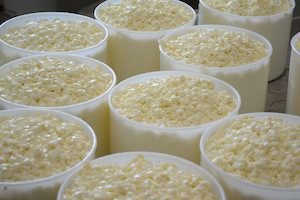 The milk goes into pails rather than travels through milk lines, to preserve its integrity for making fine cheese. 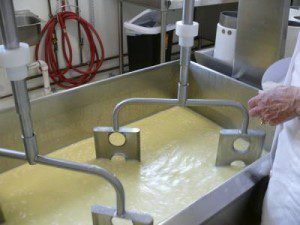 Cheese is prepared in a cheese vat that doubles as a bulk tank, keeping the milk chilled until we have enough to make cheese.